Spring started today. We can actually see it here in Tennessee. It was a nice sunny day and the temperature was pretty great, like 59 degrees. So to celebrate Spring's arrival, I made these Lemon Ginger Scones. Lemon screams springtime to me, so I couldn't resist this recipe I saw on Joy of Baking. Plus, I had some crystallized ginger in my pantry. I found it at Trader Joe's pretty cheap and I was really wanting to use it. Preheat oven to 400 degrees. Line a baking sheet with parchment or silicone mat. In a large mixing bowl, whisk together the flour, sugar, baking powder, baking soda and salt. Using a pastry blender, or two knifes, cut the butter into the flour mixture until it looks like coarse crumbs. Then, stir in the ginger pieces and the lemon zest. Add the buttermilk to the flour mixture and stir until all the dough comes together. Try not to over mix the dough. Transfer to a lightly floured surface and knead the dough together about four or five times. Do this gently. Then pat the dough into a circle, about 7 inches round and 1 1/2 inches thick. Cut the circle in half, the cut each half into 4 pie-shaped wedges. Place the scones on a baking sheet and brush the tops with some cream. (I used half and half). Bake at 400 degrees for around 20-23 minutes or until nice and golden brown. Transfer the scones to a wire rack to cool. I let them cool completely before I glaze them with the lemon glaze. Mix both ingredients in a bowl and stir until combined. Drizzle over cool scones. Spring IS here! We've had beautiful weather here - glad to know Tennessee is too! I haven't made scones in forever - ginger is such a fun and unique ingredient! I need to try this recipe and compare it to my vegan scone recipe and see which I like better. That recipe actually didn't work well with butter at all! That is one gorgeous scone, my dear! I mean it's perfect! I bet the lemon/ginger combo was fantastic! What a perfect Spring sweet treat! I've never made scones. Obviously I live (and grew up) in a region that scones to us are fry bread. Weird. I know. But, I'm going to make these at our girls' next luncheon date... they would totally swoon over these! 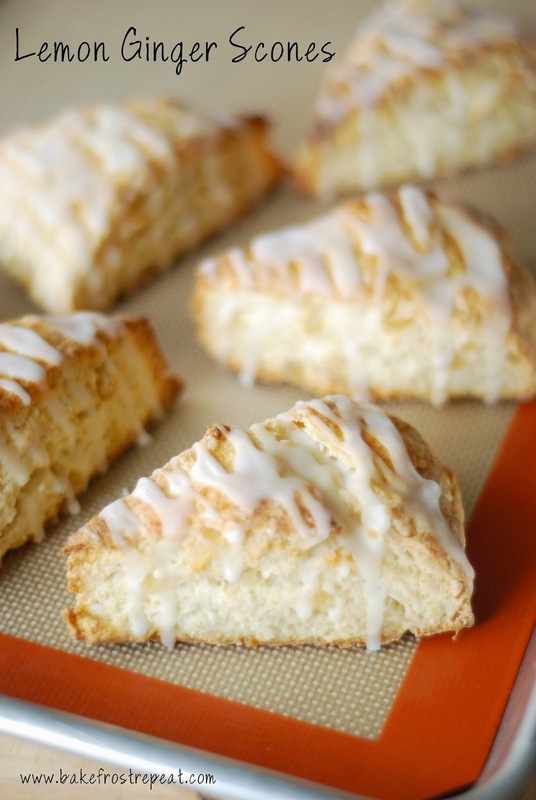 These ginger scones sound delightful! :) Lemon also screams spring to me!